The Farndale Daffodil walk is a wonderful short walk from Low Mill to Church Houses along the side the River Dove. Farndale is a valley in the North York Moors National Park starting at Lowna and ending at Rosedale Ironstone Railway (disused) and the River Dove meanders from north to south. The daffodils, said to have been first brought here by medieval monks from Rievaulx, are all wild ones known by the old name Lenten Lily a name which came from the fact they normally bloom around Easter and at the height of their season they look awesome, carpeting both banks of the River Dove, and it is well worth a visit here. Low Mill and Church Houses are both very small hamlets and are surrounded by beautiful scenery. In Church Houses there is the Feversham Arms who do meals and the Daffy Caffy who have wonderful bacon butties on the menu and they always have the kettle on. 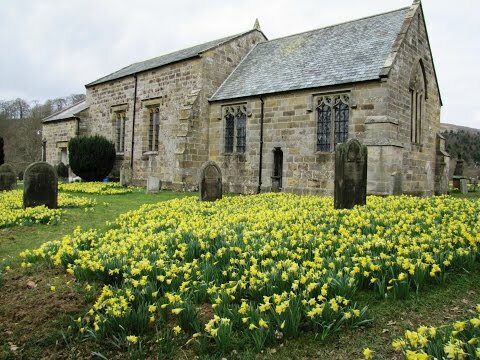 The little hidden gem of Church Houses is St. Mary’s Church where you can also see a mass of yellow daffodils. From Low Mill car park we go through the gate next to the post box and then through the next gate, over the bridge, then just follow the River Dove on our left. Don’t just look at the daffodils keep an eye open for any wildlife that might be about. Take your camera. Eventually we arrive at the Daffy Caffy and then carry on forward on the road, only for another 10 minutes until we reach a junction of roads and the Feversham Arms is on the corner on our right. We turn right in front of the pub and follow the road to the right and go over the bridge. At St. Mary’s church on the left we walk into the church yard to view the wonderful array of more wild daffodils. After a sit down and a cup of tea we walk back to the road and turn left along the road uphill slightly, passing the old school, until we come to a footpath sign on the right. We go over the stile and then over the ladder stile on the left and walk through the field keeping to the wall on the right then over another stile. We keep to the left of Bragg Farm and walk forward along the track and then bear to the right through the field to another farm this time we keep to the right of the farm and go through the gap opposite and turn right going slightly downhill through the field to a gate in the corner. We go through the gate and head forward to another gate. We go through this gate and onto a track leading to High Wold House where we keep to the right of the house. We then walk through two more fields before we arrive back at Low Mill car park. This is a very easy to moderate walk. Using OS map OL26. The first part of this walk from Low Mill to the Daffy Caffy is approx 1.5 miles and Church Houses is another 0.25 miles suitable for pushchairs and wheelchair users. The second part of the walk is not suitable for pushchairs or wheelchair users. The full walk is approx 3.75 miles. Low Mill near Kirkbymoorside in the North York Moors. Take the A170 towards Scarborough on reaching Kirkbymoorside turn left at the roundabout and head for Gillamoor. In Gillamoor village turn right at the t-junction follow the road and take the left fork which takes into Low Mill. There are public toilets at Low Mill next to the car park. For refreshments there is the Daffy Caffy and the Feversham Arms inn at Church Houses. We are told that the Narcissus Pseudonarcissus at Farndale are now coming into flwoers and this weekend 23/24 March 2012 and during the following week should be ideal times to make a visit.